Investigators in Ethiopia have released the preliminary report on the Ethiopian Airlines Boeing 737 Max 8 crash last month that killed all 157 people on board. Prior to its release, government officials said the pilots followed all of Boeing's emergency procedures, but the report indicates the power to a problematic system that controls the plane's pitch was restored and the aircraft ultimately entered a nose dive killing everybody on board upon impact. The 33-page report indicates the pilots disengaged power to the horizontal stabilizer system approximately 2 minutes and 35 seconds into the flight. However, according to ABC News consultant and former National Transportation Safety Board Director of the Office of Aviation Safety Tom Haueter, the data recorded from the preliminary report indicates that the pilots, at some point, turned the system back on which allowed a misfiring automatic safety system to take effect. The Boeing 737 Max operations manual explains that once a pilot disengages from the stabilizer trim that they should take manual control of the aircraft and does not say to attempt to turn it back on. Ethiopian Transport Minister Dagmawit Moges said earlier Thursday that preliminary findings from an investigation into the deadly crash show the aircraft had a valid certificate of airworthiness, the pilots were licensed and qualified to conduct the flight, and the plane's takeoff appeared to be "very normal." As the jet began nose diving, the pilots "repeatedly" performed all emergency procedures provided by Boeing, the manufacturer, but they "were not able to control the aircraft," Moges told reporters at a press conference in Ethiopia's capital, Addis Ababa. Ethiopian Airlines Flight 302 went down in clear weather in the morning on March 10, six minutes after taking off from Addis Ababa Bole International Airport. The American-made jet, carrying 149 passengers and 8 crew members, was headed to Nairobi, Kenya. Based on the initial report, Ethiopian safety investigators recommend Boeing reviews the aircraft flight control system of its new 737 Max 8 model and that aviation authorities verify the flight controllability has been adequately addressed by the manufacturer before resuming operations of this jet, according to the transport minister. The findings dispute reports of foreign object damage, referred to as FOD by Ethiopian investigators. "We did not find any information regarding the FOD (foreign object damage) on the aircraft," Amdye Andualem, chairman of Ethiopia's Aircraft Accident Investigation Bureau told reporters at Thursday's press conference. "The data provided by the FDR (flight data recorder) doesn't indicate that there is an FOD." Ethiopian Airlines Aviation Group CEO Tewolde GebreMariam acknowledged the preliminary report in a statement, saying the finds "clearly" show that the pilots followed instructions recommended by Boeing and approved by the United States Federal Aviation Administration. "All of us at Ethiopian Airlines are still going through deep mourning for the loss of our loved ones and we would like to express our deep sympathy and condolences for the families, relatives and friends of the victims,"GebreMariam said in the statement Thursday morning. "Meanwhile, we are very proud of our pilots' compliances to follow the emergency procedures and high level of professional performances in such extremely difficult situations." Two aviation sources familiar with the probe told ABC News that the Ethiopian Airlines flight suffered a damaged angle-of-attack sensor upon takeoff from a bird or foreign object, triggering erroneous data and the activation an anti-stall system -- called MCAS -- sending the pitch of the plane downward and ultimately crashing into the ground. According to the sources, the pilots did not try to electronically pull the nose of the plane up before following Boeing's emergency procedures of disengaging power to the horizontal stabilizer on the rear of the aircraft. One source told ABC News they manually attempted to bring the nose of the plane back up by using the trim wheel. Soon after, the pilots restored power to the horizontal stabilizer. With power restored, the MCAS was re-engaged, the sources said, and the pilots were unable to regain control before the crash. However, preliminary findings from the Ethiopian probe dispute that there was any foreign object damage, or FOD, to the jet. 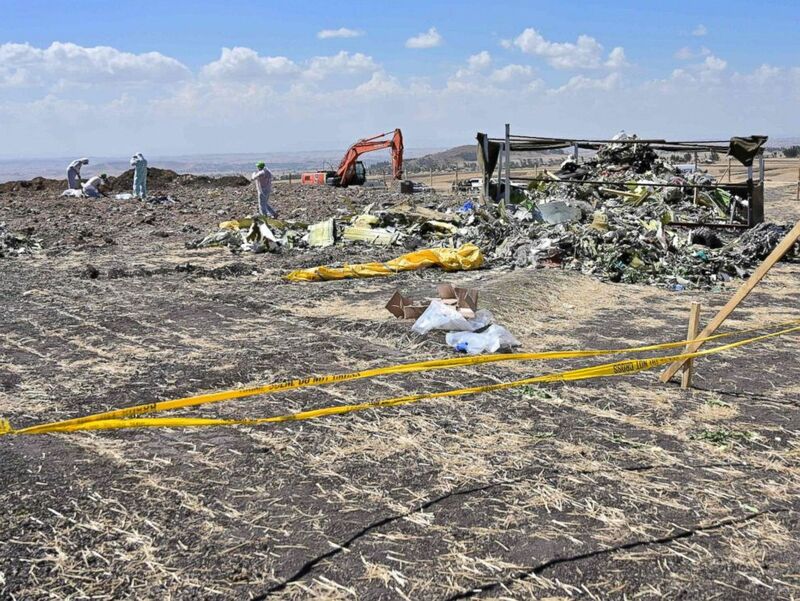 "We did not find any information regarding the FOD (foreign object damage) on the aircraft," Amdye Andualem, chairman of the Ethiopian Accident Investigation Bureau told reporters at Thursday's press conference. "The data provided by the FDR (flight data recorder) doesn't indicate that there is an FOD." A boy look as forensic investigators comb the ground for DNA evidence near a pile of twisted airplane debris at the crash site of an Ethiopian airways operated Boeing 737 MAX aircraft, March 16, 2019, near Bishoftu in Ethiopia. French and American investigators are assisting in the Ethiopian probe and at the center of it is an automated anti-stall safety system on the Boeing 737 Max 8 and its possible link to issues in the Ethiopian Airlines flight as well as a Lion Air plane crash in 2018. In both crashes, the Boeing 737 Max 8 aircraft struggled to maintain a steady flight path. The planes repeatedly lost and gained altitude before entering a dive to the earth's surface. In the two incidents, a new anti-stall safety system on the Max that controls trim -- MCAS -- was activated, sources have told ABC News. Commercial airline pilots are trained to disengage the system in the event of runaway trim, when the airplane is making unexpected pitch movements. It's unknown what would have kept the pilots of the Lion Air flight from disengaging the system and trimming the aircraft. Lion Air has defended the training of its pilots. In the days following the crash of Ethiopian Airlines Flight 302, airlines and aviation authorities around the world grounded the Boeing 737 Max 8. The United States was the last to do so on March 13, after the FAA concluded the refined satellite data that became available to the agency that day warranted a temporary grounding of the jet. Last week, the acting FAA administrator Daniel Elwell went to Capitol Hill to defend the government's response to the two crashes. Elwell told senators on Wednesday that while the FAA may have been among the last aviation regulators in the world to ground the Boeing 737 Max 8, the United States and Canada were the first to make a decision based on robust data from the aircraft. The Chicago-based aircraft manufacturer has supplied more than 370 Boeing 737 Max 8 jets to 47 airlines since the model debuted in May 2017, and 72 of them are currently flying in the United States. "We urge caution against speculating and drawing conclusions on the findings prior to the release of the flight data and the preliminary report," Boeing said in a statement Wednesday.